Lol, I can't believe you built the flat one! Yep, actually been built for a few weeks, but took some time to do the writeup. 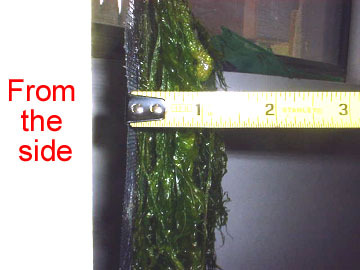 jski711 on the RF site says: "Well i ditched my euro reef skimmer and have not noticed any side effects from doing so. i'm still doing water changes on a regular basis but i have increased feedings tremendously and have no adverse side effects from doing so." keithqueef on RC says: "Update. Well i received my screen from inland (12x12) last friday. and since putting it into my system my trates have gone from red to orange to now dark yellow not quite orange, i lost my color card so i dunno numbers. the screen is dense with it." Yes, because of the lights. The screen may look evenly covered in light when you look at it, but your eyes can't tell the high power areas from the low power areas. Also, when you double the distance of the light, you would think the power of the light would be reduced to one-half; but it's actually reduced to ONE FOURTH of what it was. So when optimizing your design, you want the lights as close to the screen as possilbe, all the way across the screen. Oh I see the above links did not work well with the "&" character. To see the pics just copy and paste the whole link but take out the semicolon ";" that the system added. "Well first i'll start by giving you a little background of my tank. its been up for 2 years now and am running t5 lighting. in the past i have had algae issues and phosphates tested above .1 from overfeeding. (i'm trying to fatten up my clowns and hopefully get them spawning). i've also got a 15g tank plumbed into my system that has a pair of mandarins in it which i am also trying to get spawning. i had a sick mandarin and dosed my tank with Maracyn to try and save him. after dosing this for a week i was unable to turn my skimmer on because it would just overflow from the medicine. after doing numerous water changes and about a month later i still was unable to turn it back on, thats when i saw [the scrubber] thread. I also had to turn off my calcium reactor because the co2 was dropping my ph too low; the bubbles from the skimmer were really helping me keep my ph up but with my skimmer not running, it had to be turned off. thats when i decided to give [the scrubber] a try. i purchased a pre grown screen from inland and off i went. since adding the "scrubber" i have noticed a major increase in ph which allowed me to turn my calcium reactor back on and get things stable again. the reactor has only been back on for about 2 weeks now and im "re dialing" it in. my ph fluctuates between 7.8 at night and 8.0 during the day. I have over 30 different types of sps in my tank, just did a quick count, and i have noticed no ill side effects at all. i have also been overfeeding a ton, especially to my mandarins! 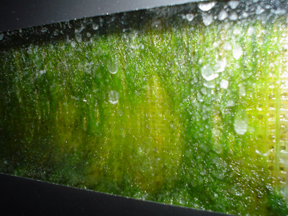 i have also noticed that the green film of algae i would get on the glass every few days has gone. I don't even remember the last time i scraped it, although in the pics you will see it needs to be done soon cause i have a ton of coraline algae on it. So IMO this "scrubber" has done wonders for me. I have been skimmerless for over 3 months now and still do my normal water changes, sometimes i do go 2 weeks but normally every weekend i do one. 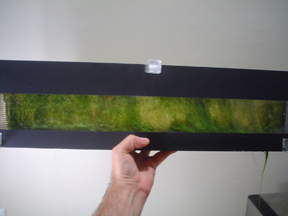 the turf that was on the screen from inland is still there but it doesnt seem to be spreading but not receding either. below are some pictures from today, they were just quick shots so sorry if they are blurry but you will see the colors i've got are great and like i said earlier i have had NO ill side effects at all." 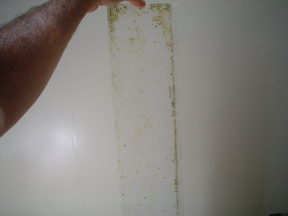 o The screen is only 1.5 inches from the acrylic wall, and thus some water does get on the wall. But this unit is currently not setup for airflow with a fan, and it has a lid, so the water never gets a chance to evaporate. 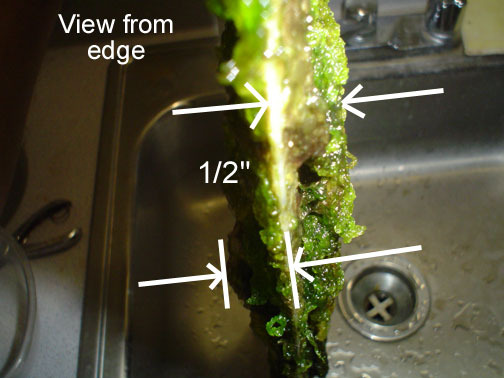 As a result very little saltcreep forms. I think I wiped it twice during the 11 days; however it did not do anything, just redistributed the droplets. On day 11 there was a small amount of creep; when I pulled the screen out I just reached in an splashed some water on it and it came off. 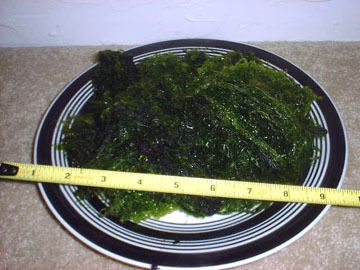 o There was a great increase in algae between day 10 and 11. 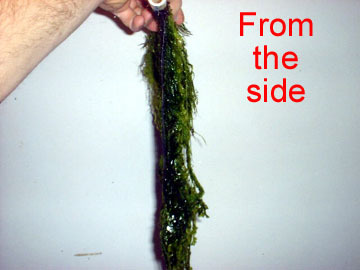 I've seen this many times: once the hair algae gets to a certain point, the next day it covers everything. 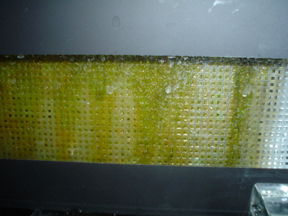 o When the screen get covered, algae start flowing down the scrubber and out the drain. Not a little, but a lot. It easily reached the botton of the sump 18" below. I just grabbed it and pulled it off. 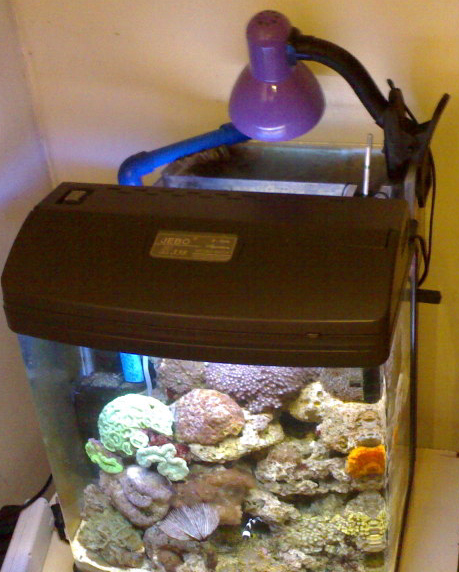 This might be a way to feed tangs, if the unit were placed on the hood of the tank. That's looking good, I've got most of the parts I need for mine, got an "Aspen" peristaltic pump, usually used for pumping collected water from air-con units. I had to alter it slightly to pump 24x7 as it has temperature probes to sense when the air con is running. Anyhow, back to drilling holes in the ceiling/walls for the pipes. Nice DIY thread....looks very effective and beneficial indeed! 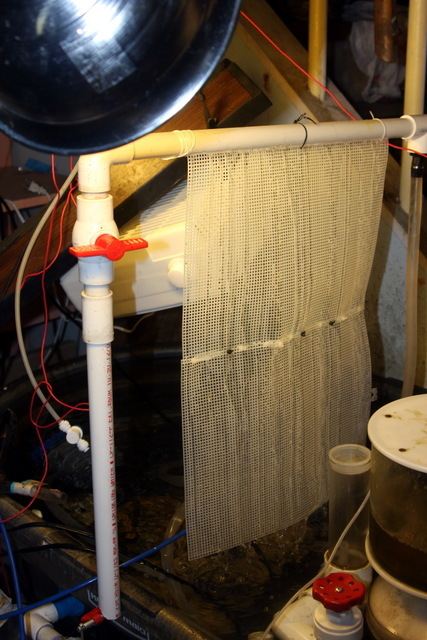 Well I'm now one step closer to getting my Algae Scrubber up and running, I've got two 6mm RO unit pipes going through my living room wall, through the bathroom, through the wall into the stairs, up the stairs, through another wall into the loft, then connecting into the peristaltic pump. Next step is to drill the holes in a spare tank I've got that will become the new "sump", and of course, put together all the parts I've got for the scrubber. I'm having a bit of a hard time finding something suitable to be the actual screen. I've got some clear polystyrene plastic (no not the white expanded stuff, the condensed plastic one ), I was thinking of cutting that down to size and drilling loads of holes in it, but it may just take too long. 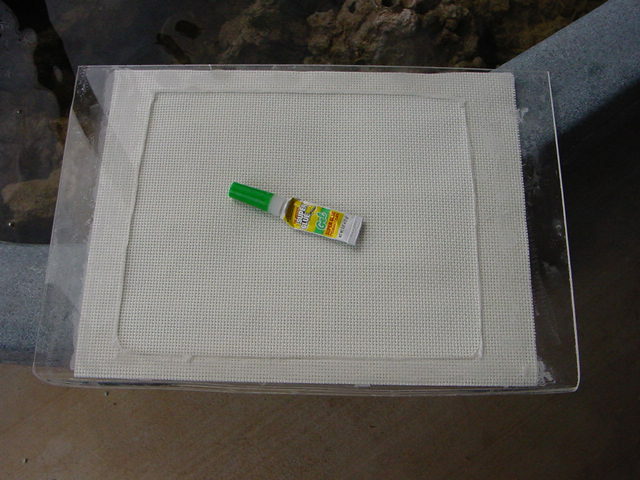 Overall the rug canvas is the best but takes the most work; the tank divider is the easiest but works least well. I think the plastic canvas is best for most people. 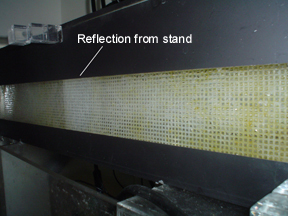 Many people ask about using the fiberglass screen from their windows (never use metal!). 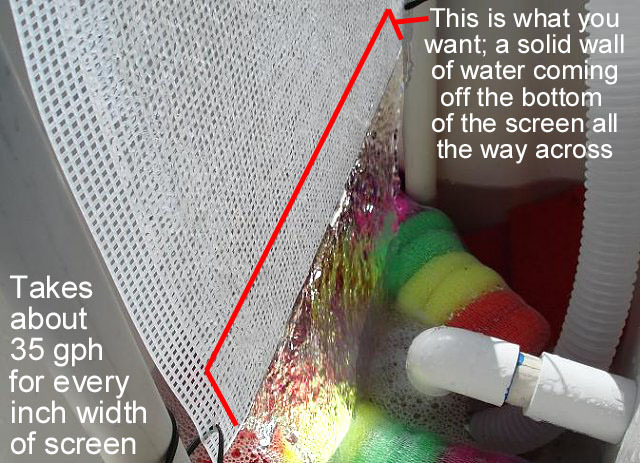 The main problem of this kind of "soft" screen will be getting it into the slot in the waterfall pipe; it will bend and fold too much. One way around this is to loop it around the waterfall pipe and attach it to itself, instead of slipping it into a slot. In this case you don't need a slot; a series of holes will work. This screen door method is only a last resort though, and will not work that well. 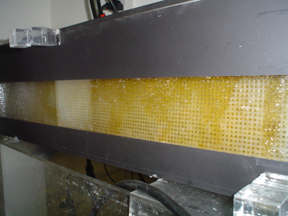 is that flow rate if you intend on using both sides of the scrubber, so if you were only going to use one side you could half that amount? I don't think you can make the flow go on just one side of a screen. So yes it is for both sides. 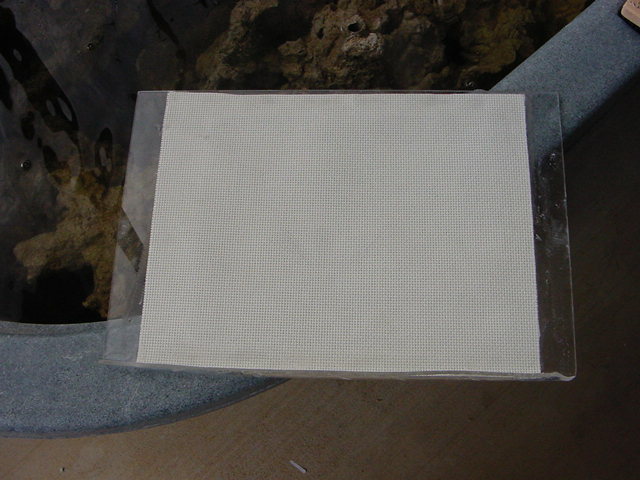 I've managed to get some plastic canvas mesh from a local material shop, roughly 2ft X 1ft, so perfect for the scrubber. I also cut the pipe to size, and had some problems with cutting the hole with the dremel for the mesh to go in. It looks like I used a cutting wheel that was too thin and it kept melting the plastic back together after cutting through it and re-sealing it! I've used a slightly thicker cutting wheel and it's given me a pretty clean cut after I put some sandpaper through the slit and smoothed it off. 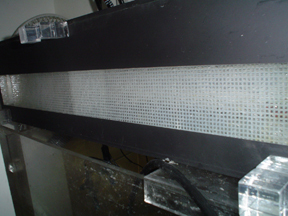 It gives a nearly perfect even flow over the mesh with a 1200lph (315gph IIRC) pump. I just need to make a mount to hold it up and mount the lights either side, then cut the hole in the tank to make an overflow for the 6mm (1/4" pipe. 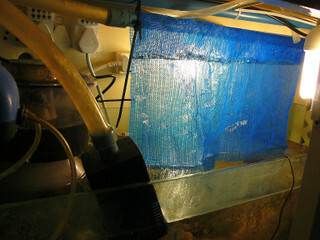 By the way, do you know if temperature makes a significant difference to the algae growth, as only 6 lph will be flowing through the tank being pumped with the peristaltic pump, and I wasn't planning on putting a heater in the tank, which will be in our loft room, which tends to be cooler than the rest of the house in winter (e.g. 15-18C), will that affect the growth? Obviously, the water that overflows back through the pipe down into the tank will be warmed up again with the two 300W ceramic heaters that are in the main tank. I'm not experienced in what temps might do what. Probably a good question for a planted tank person. But I can't see it doing too much; surely the lighting is far more important. Glad you got that slot made... that must be 80% of the whole project. And what is this.... dinner? 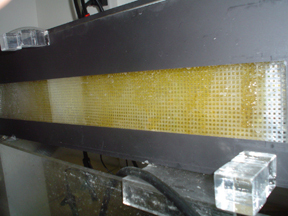 ...Nope, it a week of growth from just one side (the 6500K side) of my acrylic unit. 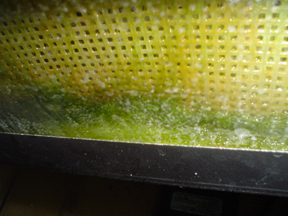 "Pong" on the RF site said "i had a lot of green hair algae growing on my screen. 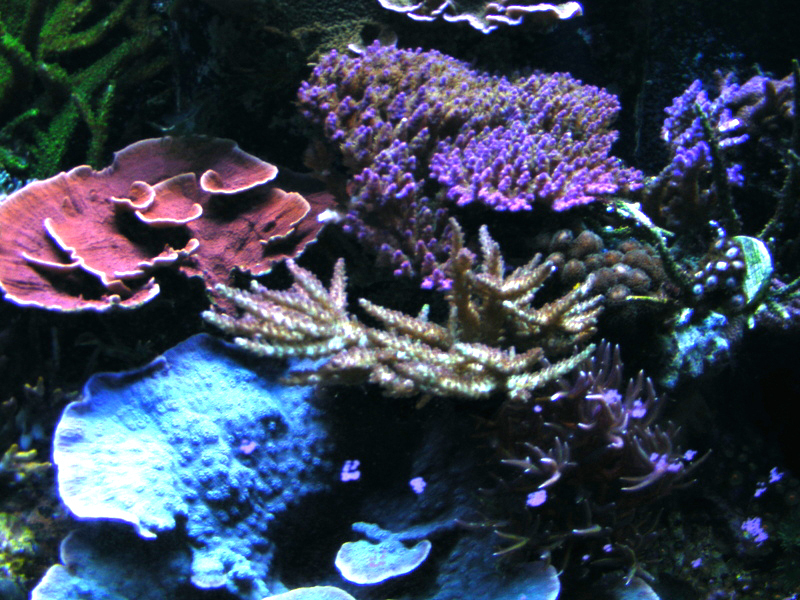 noticed that the red algae in my DT has lessened dramatically." "Johnt" on the UR site said "I've always used phosphate remover. I've tried most makes but always ended back using Rowa. 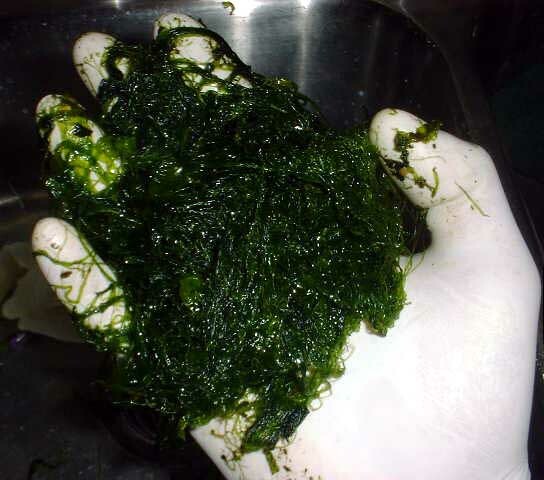 since running the scrubber I've stopped the phosphate reactor and despite the scrubber not yet being at the Turf Algae stage the phosphate readings are dropping." 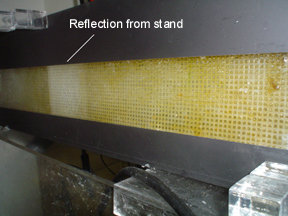 He knows that the part of the screen underwater will not contribute, so he made sure the part above the water had enough size to handle things. We'll see how LED's work! 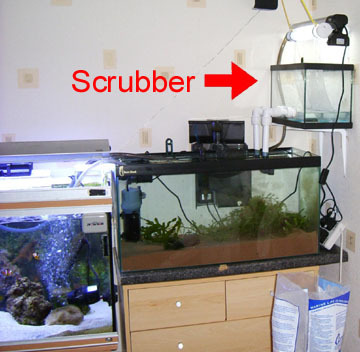 Lighting Duration: Set up your scrubber lighting on a timer for 18 hours ON, and six hours OFF. 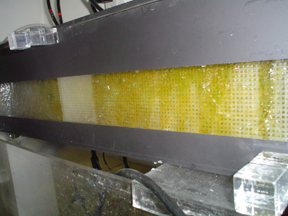 The scrubber itself won't care when those hours are, but if you want, you can have them on when your display lights are off, so as to help balance pH in the system. 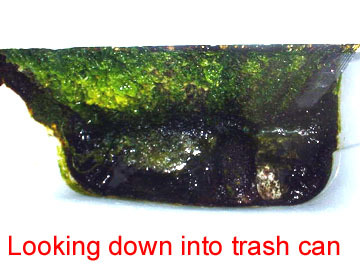 Here is a note to skimmer manufacturers, as well as manufacturers of acrylics/plastics, lighting, and pumps. 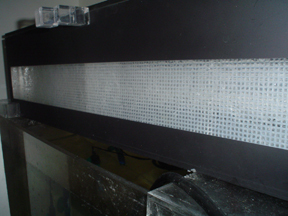 One way to benefit from scrubbers is to start building them, so as to make life easier for aquarists. There is no patent, and I have no interest in building them, although designing them is fun. Promoting them is fun too. But manufacturing is not my thing, so hopefully some folks will start making at least a simple version (like the Santa Monica 120) available. 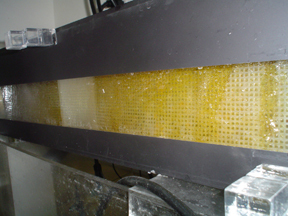 Look at it like this: Manufacturers of skimmers currently make an expensive product that has pumps and acrylic/plastic parts. 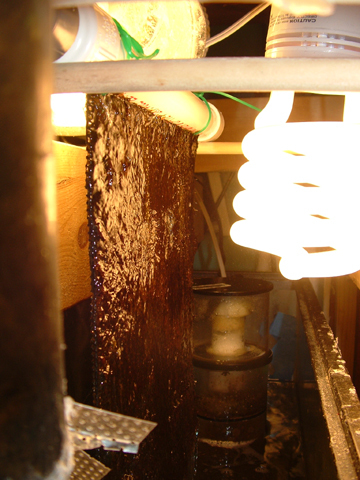 Manufacturers of lighting currently make an expensive product that has bulbs, ballasts, and frames. Neither of these products has all these parts in one unit. o A simple low-cost design; just an acrylic box, preferably with a mirror inside finish. The customer would add all other parts. This is what I built. 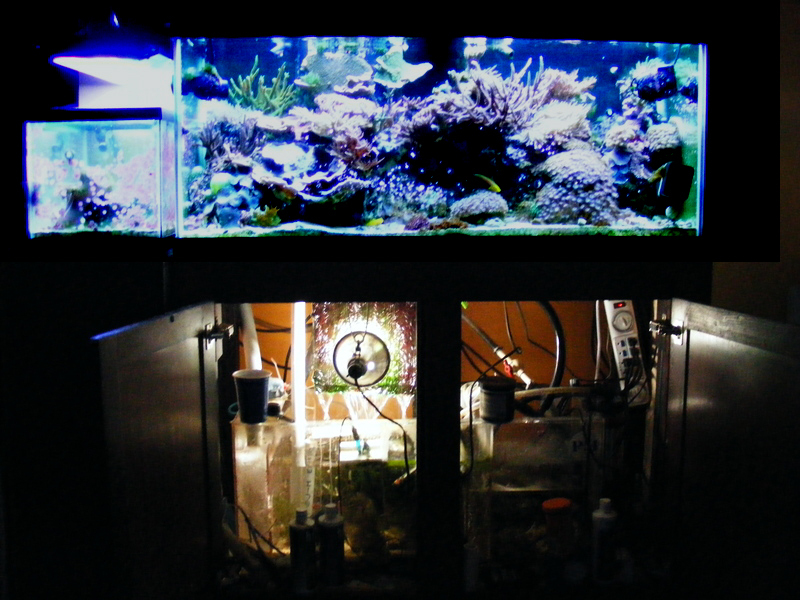 o Complex designs that would be needed to fit into the many different places that aquarists have: Above a crowded sump, behind the tank, vertically next to tank, next to a tank in a stand-alone furniture finish, or on the wall as a decorative item. 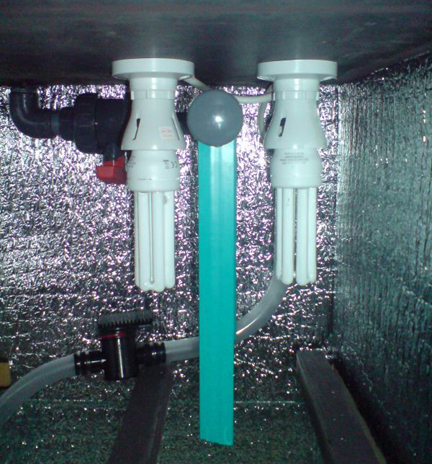 o Skimmers designed to work with scrubbers, by having one connect/feed the other. o Scrubber lights with built-in timers, for nanos. o Ultra small scrubber boxes for nanos, possibly with self-contained LED lights, the size of a cell phone. o Nano hoods with scrubbers built into them. 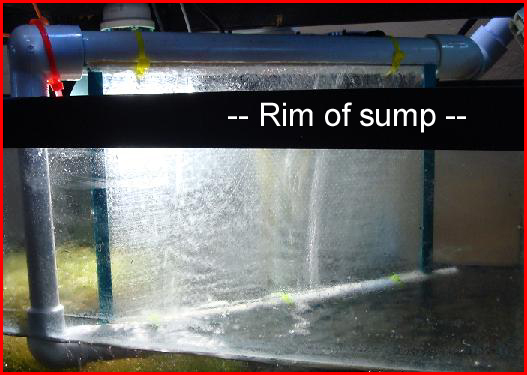 o Sumps with built in scrubbers, instead of built-in wet/dry's. 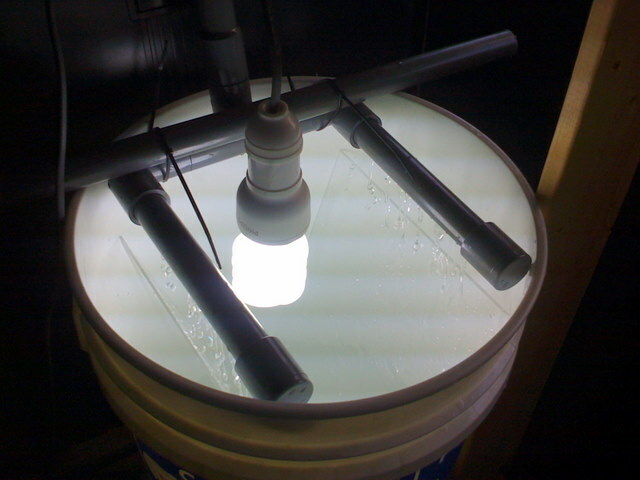 o Display lighting-fixtures with scrubbers connected to the back of them, such that the scrubber uses the same light. 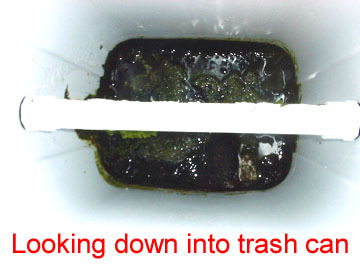 o Tank options, such as scrubber-on-backside. o Auto-cleaners that clean/scrub/scrape the screen automatically. 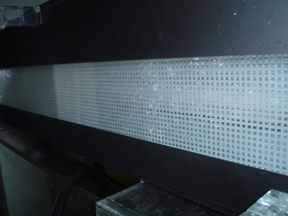 o Hand/electric tools specialized to clean the screen. o RODI sprayers that give the screen a FW spray periodically (to kill pods), possibly doubling as a top off. o Non-destructive pumps to get pods from the sump to the display. o Self-priming pumps built in to scrubber, for placement on top of displays with no sump. 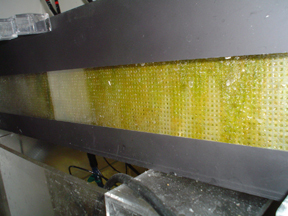 o Double and triple thick screens, which allow algae to stick better during cleanings. o Multiple screens, with large areas for large tanks. 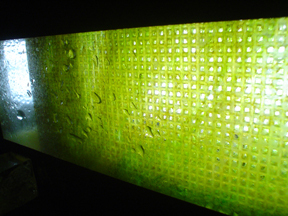 o Ultra thin LED powered flexible screens, which could weave around obstacles. o Fan on a temp controller, to keep water temp preset. 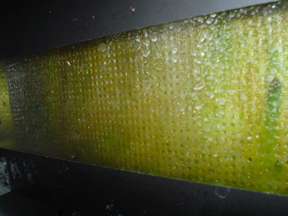 o Uniquely shaped T5 panels, such as 12 X 12, to perfectly fit a screen. o Safety switches that cut off the lights and/or flow during certain conditions. 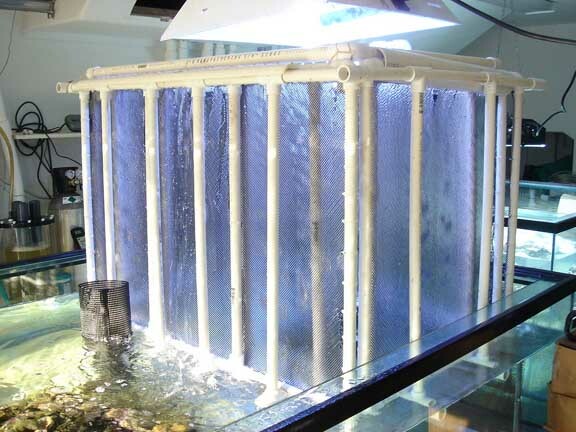 A great first model could be targeted to smaller tanks (SW and FW) that may not have sumps, and thus would include a self-priming pump inside the scrubber. It would sit on or near the display and would pull water up to it. 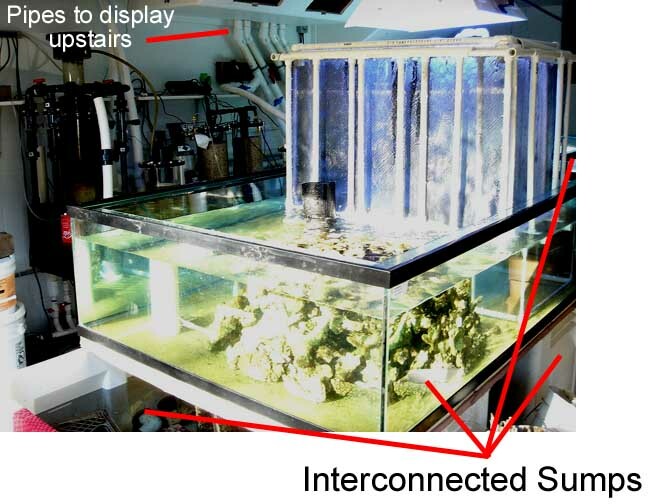 It would drain right back to the display, and would give the customer the option of letting the algae grow out the drain (and into the tank to feed the fish), or removing the algae as it comes out of the drain, before it gets to the display. "darkblue" on the RP site says, "Been running a 4"x10" OHF [over head filter scrubber] version on my 15g for almost 2 months already. My Nitrate reading started dropping after around 3 weeks. I've had 0 Nitrates for a month now. I'm using Seachem for my tests. The screen is just partially covered with what I think are patches of brown turf." And "jfdelacruz", also on the RP site, says "I recently implemented this on my tank. 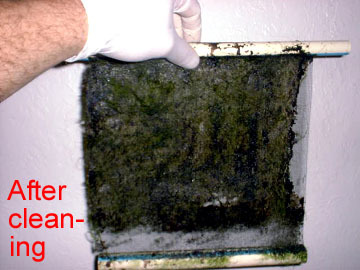 I [originally] had an overhead filter to try and filter out a lot of detritus, and changed out filter foams every week. 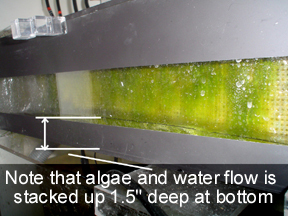 nitrates and phosphates were high and I had brown algae (kinda like cyano) on my sandbed already too thick to fight. I did the 2 days lights out and it took out the brown film algae. 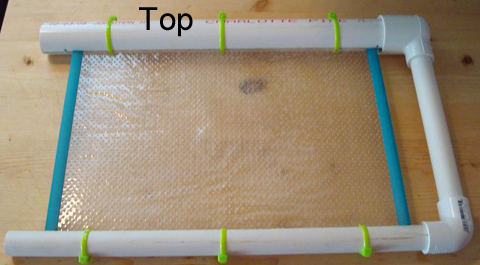 I bought a 10watt fluorescent light from carti and then cut a right fit cross-stitch cloth as my screen and layed it flat on my OHF and took out the foam. lights are on 24/7 [temporarily]. I'm on my 5th day and algae is basically non existent in the tank, while the whole cloth is covered in the same brown film algae that covered my sandbed and is starting to grow the green algae. 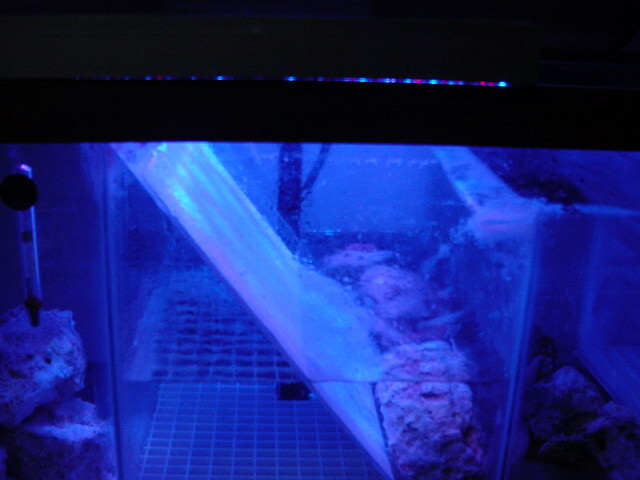 10,000K ung fluorescent and after day 2 it already had algae on it. on day 3 the whole cloth was lightly covered. im still waiting for day 10. also Im going on a 2nd week no water change just to try it out and so far everything's doing good. 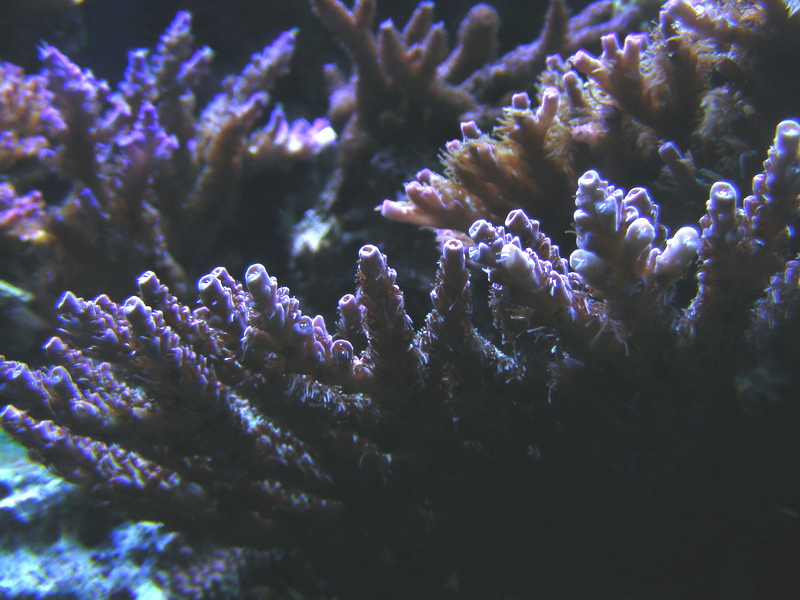 coral's are happy and clam is happy. 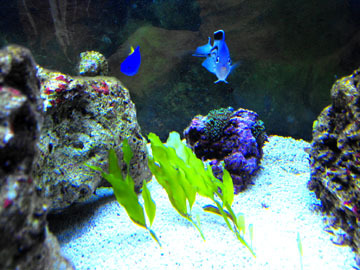 inverts and clownfish is also happy and eating lots of cyclopeeze everyday! So it was a half-pound of wet green hair, about the same as last week. 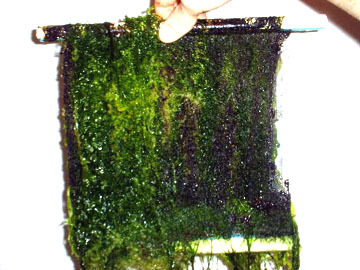 Once thing about cleaning green hair compared to real turf (my other screen that's now at the LFS) is that it slides off so easy, it's hard to leave any on the screen. I tried to only clean one side, but some of the other side detached too. You can almost just run tap water over it, and the loose stuff comes off. Maybe a better design is two half-screens, so you can just pull one out and clean it completely, while not touching the other one. Some interesting ideas there. I'll admit to thinking about adding one of these to my upcoming frag system. Should be rather easy to implement with my setup. Why Larger Is Not Better: A larger screen, by itself (without larger lights), is not better than a smaller screen. 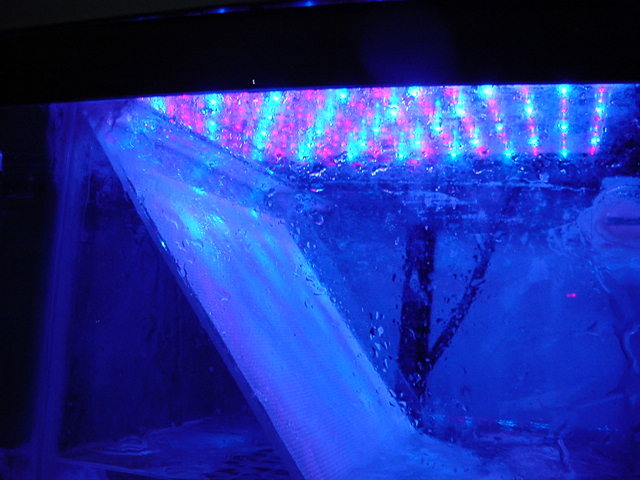 This means that if you want more nitrate and phosphate removal from your water, the best way to do it is by getting stronger lights, or by moving the lights closer to the screen. If all you do is get a larger screen, the new larger edges of the screen will be too far from the light to have any effect. 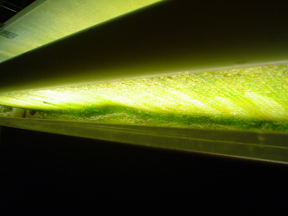 Of course, the most effective way to increase nitrate and phosphate removal is to do all three: Increase screen size; add more lights to cover the new screen parts; and position all the lights closer to the screen. 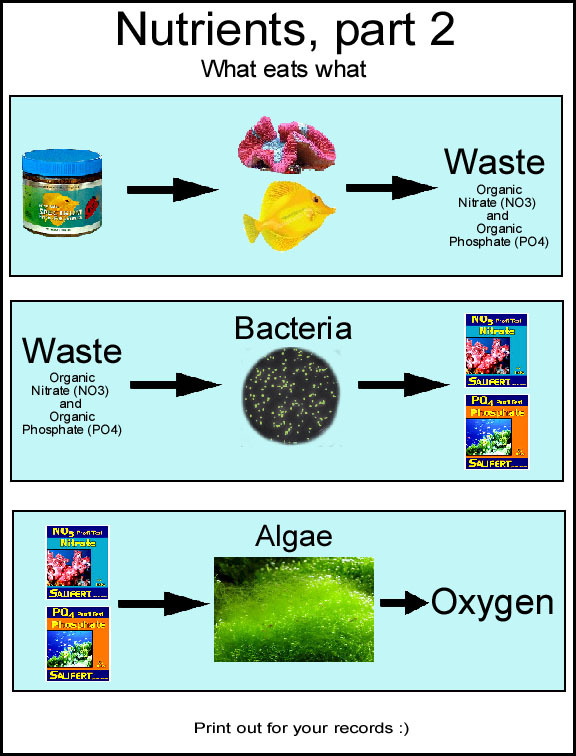 Food --> fish,corals --> Organic Nitrate, Organic Phosphate. 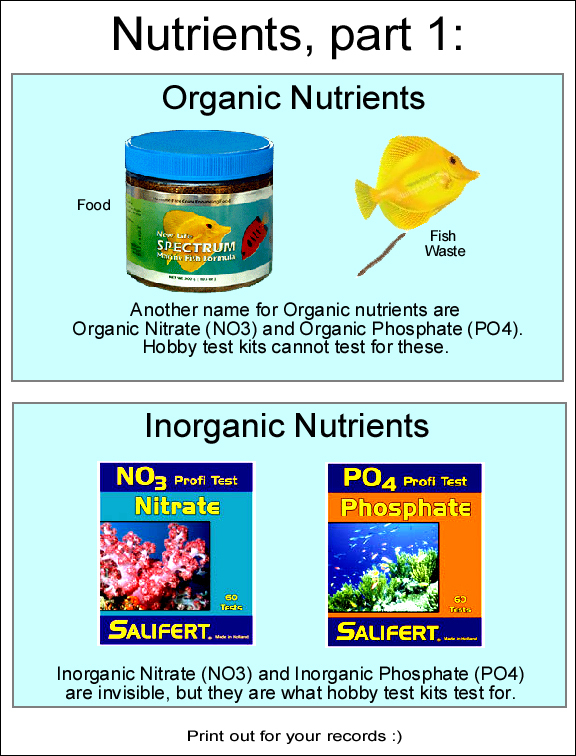 Organic Nitrate, Organic Phosphate --> Bacteria --> Inorganic Nitrate, Inorganic Phosphate. 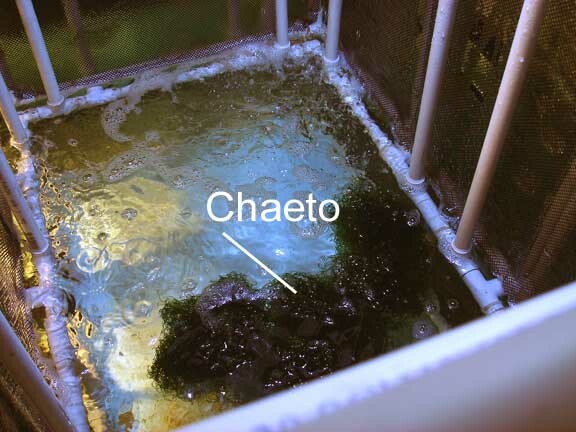 "Detritus [waste] ... is the principal food source for the many bacterial species that work in various nitrification and denitrification activities. 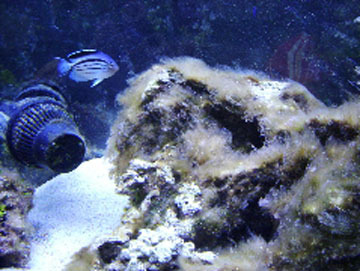 Before reaching the microbial community, however, [waste] acts as a food source for the smaller consumers such as amphipods, copepods, errant polychaetes, protozoans, flagellates, ciliates and other animals whose activities contribute to the stability and productivity of a coral reef and a coral reef aquarium." 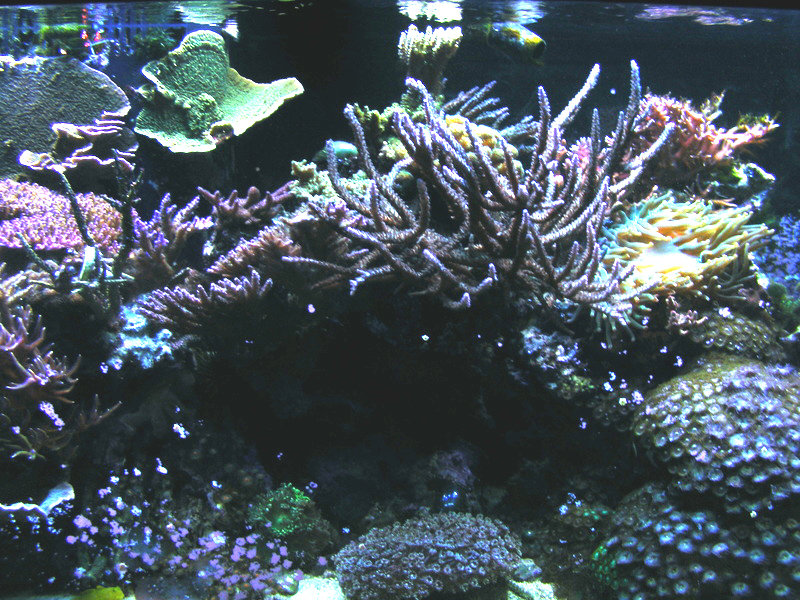 "Of the many food sources available to corals and already discussed in this series of articles, particulate organic material [waste], dissolved organic material [DOC/DOM], and bacteria are the most universally accepted food sources"
"The use of detrital material, or particulate organic material, as food source is a cornerstone of coral reef ecology and forms what is well accepted to be the base of the entire food chain"
1. The day you see the first very light-brown color on the screen. 2. The day you see the screen covered left to right, top to bottom. 3. The day AFTER you think you saw your N or P test go down. Because that day after, you tested again to be sure. 4. The day you realized, for sure, that the the piece of filtration equipment you removed last week was really and truely not needed. 5. The day you finally realize that the N and P problems you've been fighting for (weeks, months, years) are finally gone. 5. The day another aquarist asks you, "How did you do it?" 1" - The light-power is full strength. 4" - At 4" distance, the same bulb power has to cover four times the area, so the power per square inch is only 25 percent of what is was (reduced 75%). 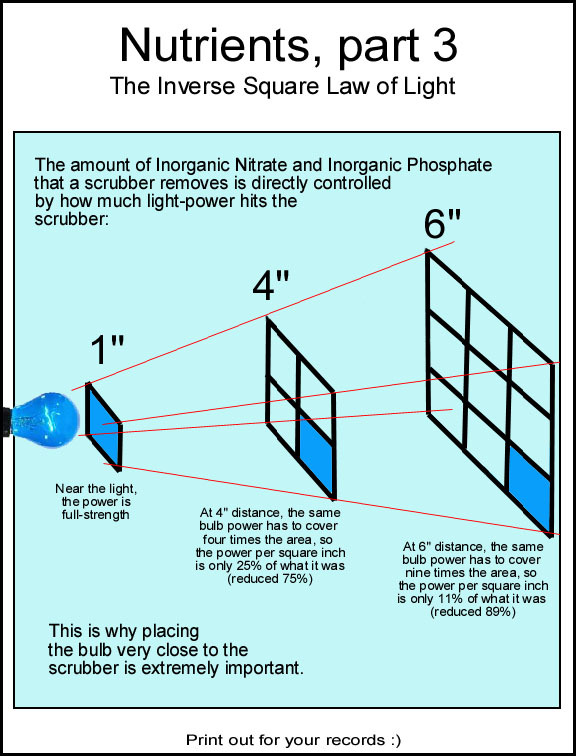 6" - At 6" distance, the same bulb power has to cover nine times the area, so the power per square inch is only 11 percent of what is was (reduced 89%). 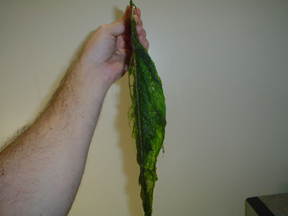 This is why placing the bulb very close to the scrubber is extremely important. The trick is to have 35 gph (adjustable) for every inch width of the screen. 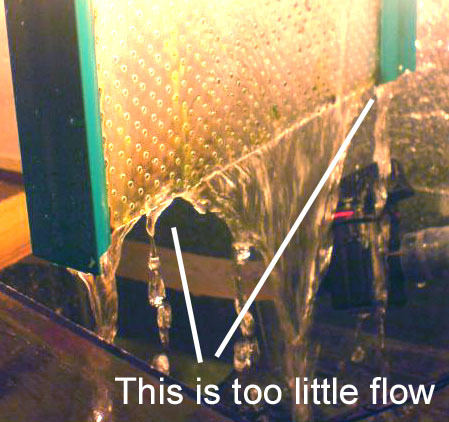 And this is assuming your waterfall pipe has a slot. If your pipe uses drilled holes (not recommended) then you will use less. 8/21: this guide is awesome, i,m gonna be building me one of these as soon as i get some time to myself, thanks for posting this so everyone can see and share. 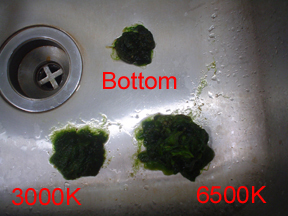 9/10: what is the best way to get rid of nuisance algae, despite regular water changes and picking this stuff off the rocks it keeps growing back, my nitrates are 0ppm confirmed with 2 different test kits. my phosphates are also 0ppm with different tests. 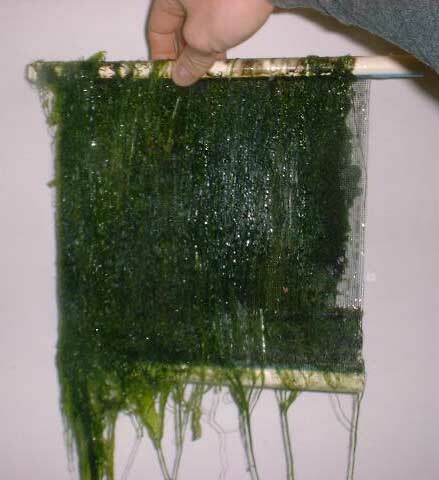 i have since set up a turf algae screen but that has only been running for a day and a half so its not working yet. 9/10: [waterfall pipe is] just an ordinary gravel vac pipe, fed by my external canister filter, the light is above at the mo i need to go out and buy some brackets and 2 light fixtures so i can have a light either side of screen, the other end of the gravel vac pipe has a water tight access plug, so i can still get in to clean the pipe. 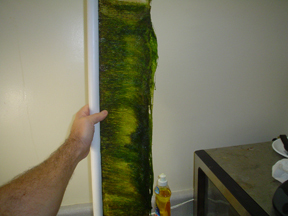 this nuisance algae just keeps on growing despite regular water changes picking it off the rocks, this stuff is ugly no matter what i do it just dont wont to disapear, this turf filter is my last resort. 9/13: i am determined to get this right but sometimes its so disheartning to see a tank that you try your very best to get things right to just keep getting covered in crap algae. 9/18: over the last couple of days i have noticed the nuisance algae i've been suffering with is eventually starting to die off. i'm sure the second 60 litre tank that i placed my calurpa green grape and cheato are starting to take up the nutrients before the nuisance stuff, i'm so pleased today that my tank is half way to looking great again. 9/20: i have done 2 small water changes whilst siphoning out as much as possible, i'm quite glad now i,m eventually getting back on track, my water is crystal clear all params are spot on, i had feared of water turning a bit yellowy with the release off the nutrients from the dying algae but i have had none of that. [...] hopefully fingers crossed i,ve got a hold on this now. 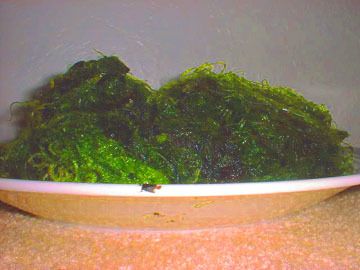 9/23: [answering "how did you do it"]: it could be a number of elements, i took on board all the advice which i received which im totally greatful for, i set up a 60 litre tank next to my main dt and filled it with a 4 inch deep sand bed, plus added culurpa green grape and cheato, i set up a temporary turf algae filter as suggested by Santa Monica in his thread under mega powerful nitrate and phosphate remover, i have continuously picked at the stuff and used a toothbrush to gently wipe over the rocks and inside the nooks and crannys, no doubt scaring my fish half to death, the only thing i haven't done yet is to replace the skimmer, i should say upgrade the skimmer, currently running a red sea pro prism, i had advice to get rid of it and get a better one. and also added another koralia 2 to improve water circulation which i placed at the bottom of dt to serge current over sand bed. increased slightly the amount of water i take out for water change, from about 90litres to about 125litres every 2 to 3 weeks. on the whole it could be any number of things i have done if not all, and once again i would like to thank all of you for your advice and recommendations. 10/9: i,ve nearly cracked it, this nuisance algae have a look at these pics to see, i'm over the moon its nearly all gone. 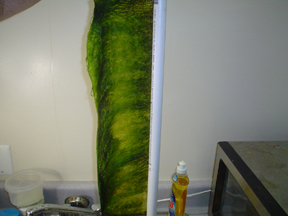 10/16: i've been running my scrubber for about a month and a half now, n and p are zero, i have always had a zero n and p reading using the salifert test kits, but when i had that nuisance algae problem i was told the kits were registering zero because it was quite possible that the algae were taken it all in. if that makes any sense. ps another note i'd like to thank you again for your hard work and commitmant in keeping this thread a live and with the great pics your posting up, keep up the good work, without your posting of this thread i wouldn't have even known about these turf filters, so once again a BIG THANKYOU. 9/23: its a pre grown screen from IA. [...] my nitrates are up, its only been 2 weeks and it looks like there at a stand still, but im feeding heavily, lot of anemones in there. 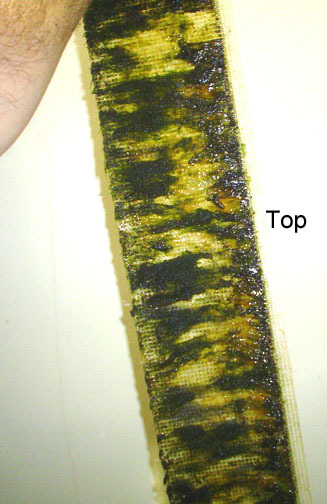 also where the light is the brightest theres a certain type of algae that looks like an oil spill , its got a rainbow of colors yellowish greenish brown. also no yellowing in my water. [...] i run a skimmer just cause my numbers are up there, but when there down to nuthing then ill remove. 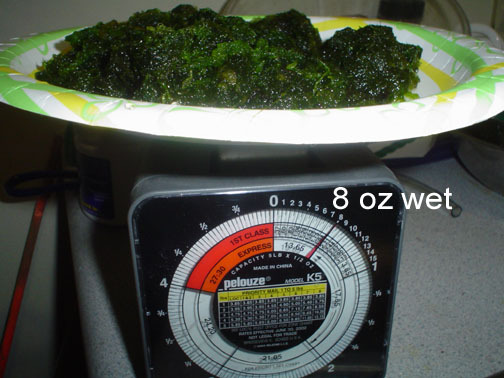 ...and i only have about 35 lbs of liverock, maybe. thats pushin it. 2" sandbed, run an undersized skimmer, i think euro reef made for 55g. i test with api nitrate test, and i lost the color chart, but yellow good, red bad, im orange. and since ive been testing it looks like its getting a lighter color. [It] was usually just goin up everyday, but with the new light i think that will speed up the growing process. 9/26: i cleaned monday and today is friday, and i have to clean again. [...] the other side is getting there, still needs to catch up tho. [...] no lights on a timer, runnin it for 24/7. [although should be changed to 18 hours ON, and 6 hours OFF]. pump is on a timer, 30 [seconds] on 30 off, its just that the screen from IA was one sided and thats why the other side has to catch up.